Also known as "Trixie Lulamoon holds all sort of things 2". 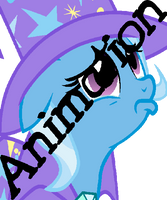 I love this editable Trixie. "Oh dear, this taco is great, powerful and spicy, but..come on Patricia...control yourself...unless that really cute Sonata Dusk invited you to taco night...in which case, must...do up my hair...in the same style Sonata does." Murphy's law. Not even the Greatest and most Powerful is safe from it.